I remember when I myself filed a complaint against Robin Jean Davis and for GOOD REASON – It was published in the GILMER FREE PRESS back in the hay days of the FREE PRESS in Glenville. In fact they were pretty upset in Charleston that I was able to get any press coverage at all regarding my official complaint filed with the Judicial Investigation Commission in Charleston. It appears now, that some of my valid complaints against one of the good old boy crooks – that is a woman – that also likes to date a black man or two on the side — while performing duties as the Chief Justice of the West Virginia Supreme Court – is coming to light in the COURTS with an IMPEACHMENT TRIAL. CHARLESTON – Former state Supreme Court Justice Robin Jean Davis’s impeachment trial has been continued. On Oct. 15, Cabell Circuit Judge Paul Farrell, who is the president judge in the impeachment trials in the state Senate for four current, former and suspended Supreme Court justices, issued an order granting a motion Davis filed Oct. 12. Davis filed her motion a day after the state Supreme Court issued a 5-0 ruling saying the three Articles of Impeachment that name Chief Justice Margaret Workman violate the separation of powers doctrine. It ruled the state Senate also does not have jurisdiction over the claims made in those three articles. Davis’s motion was filed by Tim DiPiero and Lonnie Simmons of the Charleston law firm of DiTrapano, Barrett, DiPiero, McGinley & Simmons. The Workman opinion was a 5-0 ruling, with two acting justices filing a separate opinion dissenting on a few points. In the Oct. 15 Davis order, Farrell also noted that Davis had new counsel of record and that those attorneys needed time to “review the voluminous record” in the case. DiPiero and Simmons recently joined Davis’s legal team, replacing Robert Allen and Pamela Deem of Kay Casto & Chaney. In her motion, Davis had noted the similarities between her case and Workman’s case. The impeachment trial for Davis was scheduled to begin Oct. 29. Davis retired Aug. 13, the same day the House of Delegates passed 11 articles of impeachment against her and the other members of the court. During a press conference the next day, Davis was critical of the impeachment process, calling it political. She said she resigned then so voters could elect someone to her seat rather than have Gov. Jim Justice make a permanent appointment. Earlier this month, during a pretrial hearing in the Senate, a majority of senators voted down a motion that would have dismissed Davis from impeachment trial. The motion was rejected on a 15-19 vote. The vote was not along party lines. Last month, Davis filed a lawsuit in federal court to stop her impeachment. And even though Davis has resigned, impeachment might prevent her from running for office again and collecting her state pension. The court’s Workman opinion was a 5-0 ruling, with two acting justices filing a separate opinion dissenting on a few points. Those articles focus on the payment of senior-status judges and claims Workman and the other justices failed to implement administrative policies and procedures. The writ essentially says the legislative branch does not have the power to prosecute members of the judicial branch and that a state law setting a cap on payments to senior-status judges is illegal. It says the state Judicial Investigation Commission handles judicial complaints. It also says lawmakers didn’t properly follow the due process clause because they failed to formally adopt an impeachment resolution. It says because the House didn’t follow proper procedure, all of the articles of impeachment are invalid. Five circuit judges presided as the Supreme Court after Workman recused herself. Justice Beth Walker and temporary Justice Paul Farrell also stepped aside. Acting Chief Justice James Matish delivered the opinion of the court, and acting Justices Duke Bloom and Jacob Reger also issued a separate opinion, concurring in part and dissenting in part. While the writ issued by the court is about Workman’s impeachment trial, it could be precedent for the pending impeachment trials of Davis and suspended Justice Allen Loughry. Justice Beth Walker already has been acquitted in her impeachment trial. “This case is not about whether or not a justice of the Supreme Court of Appeals of West Virginia can or should be impeached; but rather it is about the fact that to do so, it must be done correctly and constitutionally with due process,” Thursday’s writ stated. Matish also wrote that procedural safeguards built into the impeachment process have not been followed. “In this case, there has been a rush to judgment to get to a certain point without following all of the necessary rules,” he wrote. “We are a nation of laws and not of men, and the rule of law must be followed. By the same token, the separation of powers doctrine works six ways. The Courts may not be involved in legislative or executive acts. The Executive may not interfere with judicial or legislative acts. “So the Legislature should not be dealing with the Code of Judicial Conduct, which authority is limited to the Supreme Court of Appeals. Marc Williams, who is representing Workman in the matter, called the ruling “an overwhelming victory” for Workman. “It’s very detailed, and it’s clear the court spent a significant amount of time on the issue,” he told The West Virginia Record. “The fact is that the impeachment process was flawed from the beginning. And now, rules have to be followed, especially if you’re dealing with something as important as impeachment. Still, Williams said he thinks the chance of the U.S. Supreme Court hearing the state Senate’s appeal is small. “This was a flawed process from the beginning,” he said. “The House had adopted rules intended to protect the due process rights of the defendants. Then, for whatever reasons, they didn’t follow those rules. The opinion says their failure to follow their own rules is a failure of due process. In their separate opinion, Bloom and Reger say the Legislature has “absolute discretion” to seek to re-impeach Workman against based on the maladministration allegations in Article XIV. They also said the court should have heard oral arguments in the case despite the fact the Senate waived the right to them. “Many of the issues presented are related to transparency,” Bloom and Reger wrote. “Not having oral argument eliminates the opportunity for a more thoughtful discussion with the parties and perhaps greater illumination of the issues for the court. In her writ, filed Sept. 21, Workman says the impending state Supreme Court impeachment trials in the state Senate must be halted because the House of Delegates overstepped its bounds and tried to undermine the separation of powers of state government. The respondents listed were Senate President Mitch Carmichael, President Pro Tempore Donna J. Boley, Senate Majority Leader Ryan Ferns, Senate Clerk Lee Cassis and the entire state Senate. “This writ is not intended to provoke a constitutional crisis; it is intended to prevent one,” it states. In the petition, Workman argued that the Articles of Impeachment violates the principles of separation of powers by usurping powers explicitly reserved for the judicial branch of government. Specifically, she said the articles exert legislative control over the judicial branch’s budget powers and appropriate the judicial branch’s exclusive power to regulate judicial conduct. 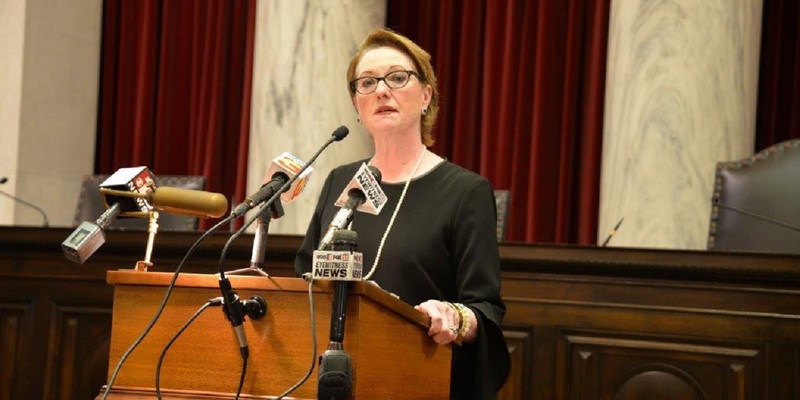 “There are serious problems with the impeachment process that need to be addressed in a court of law, not in a political setting,” Williams previously told The West Virginia Record. Workman also maintained the Articles violate the state constitutional precedent for appointment of senior status judges. And, she says the House never voted on the resolution authorizing the Articles of Impeachment, making the Senate trial illegitimate and unconstitutional. “On August 13, 2018, the West Virginia House of Delegates broke the law,” Workman’s petition states. “On that day, the House adopted numerous Articles of Impeachment setting the petitioner to stand trial before the West Virginia Senate. What nefarious deeds of the petitioner served as the basis for these Articles? The petitioner had the audacity to fulfill her constitutional mandate of ensuring that West Virginia courts efficiently serve West Virginia citizens by appointing senior status judges to fill judicial vacancies. She had the audacity to exercise her constitutional authority to pass and utilize a budget for the state’s judicial branch. “In short, she had the audacity to perform her duties and exercise the powers mandated to her by the West Virginia Constitution. Despite the clear edicts of the West Virginia Constitution, the House overstepped the bounds of its constitutionally-apportioned power and initiated proceedings to punish the petitioner for exercising the powers explicitly provided to the judicial branch by the West Virginia Constitution. Workman also argued that the judicial branch has the sole authority to regulate the conduct of judges. She says impeachment Article 14 usurps that power. “However, the sweeping authority granted to the Legislature through the Impeachment Clause is limited by the requirement that impeachment proceedings comply with the law,” Workman argued. Workman is being represented by Williams, Melissa Foster Bird, Thomas Hancock and Christopher Smith of the Huntington law firm of Nelson Mullins Riley & Scarborough.